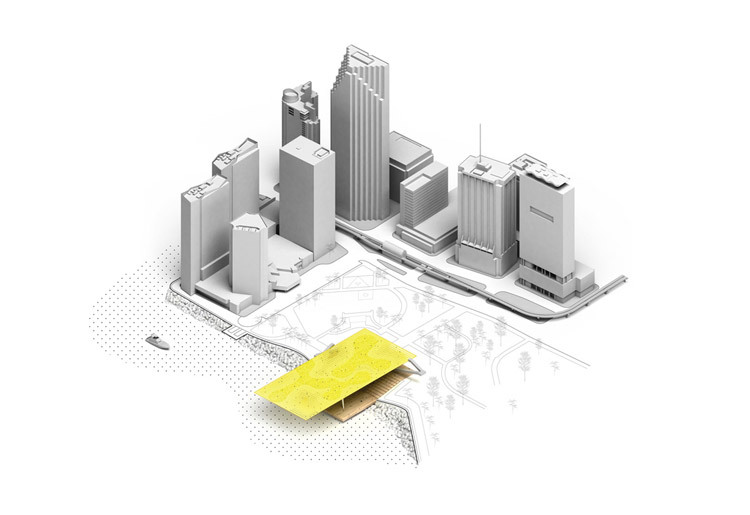 Lemonade Square est un projet conçu dans le cadre du concours d’idées Landmark Miami organisé par DawnTown, un organisme dont la mission est de promouvoir l’innovation en architecture dans le centre-ville de Miami. Le défi à relever dans le cadre de cette compétition était celui de développer un nouveau symbole architectural pour la ville de Miami contribuant positivement à l’image de marque de la ville. 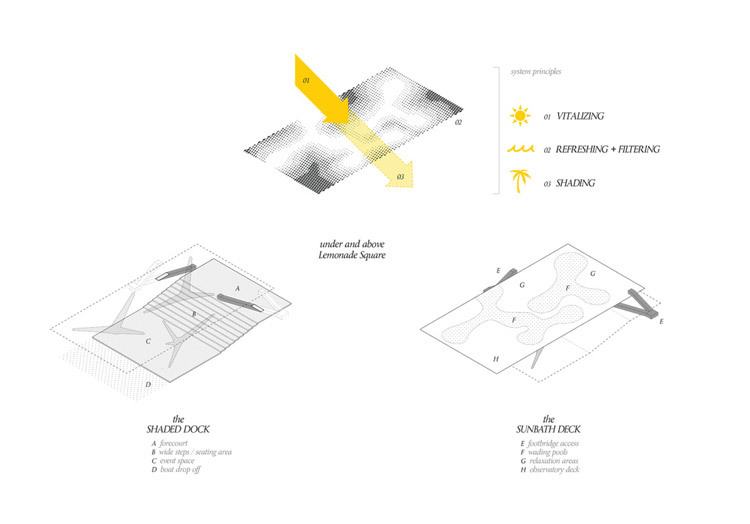 [TEXTE DE PRÉSENTATION, VERSION ORIGINALE] The concept of Lemonade Square is a perforated platform of 57,600 square feet, floating above the ground. Standing on delicate legs, this museum-like object succeeds at creating superimposed plazas with complementary characters. The upper part holds giant wading pools and allows people to escape from summer heat. Underneath, a glamourous public place benefits from surprising sunlight effects and offers to the city a unique contemplative site. Featuring an unusual spatial configuration, this open space will have the quality to host, in a creative way, a variety of events and gatherings. 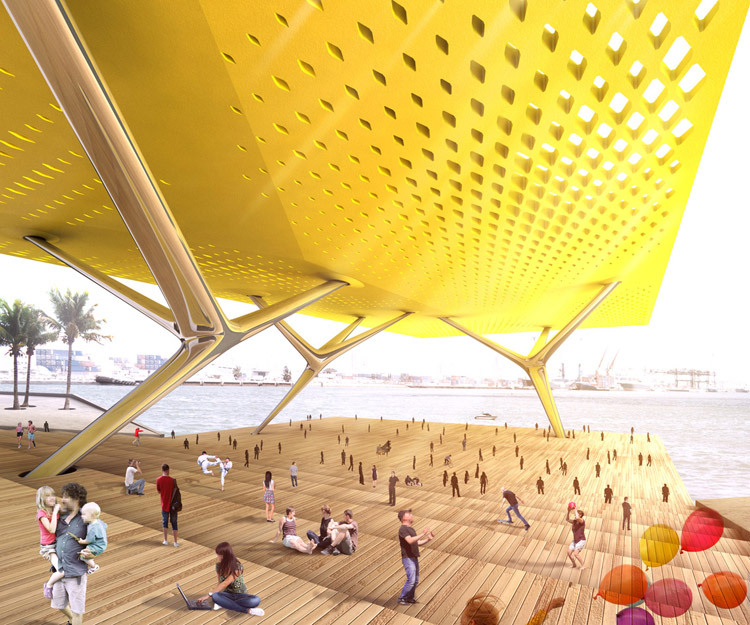 This new architectural icon is hence more than a response to Miami’s tropical climate, it will also participate in the branding of a renewed identy for the downtown district. Setting up a high standard of urban development, it will inspire tourists and locals as well as other world’s metropolises.